UPDATE: JIO SUMMER SURPRISE OFFER HAS BEEN REPLACED WITH JIO DHAN DHANA DHAN OFFER WEF 11TH APRIL 2017. SO IF YOU ARE VISITING THIS PAGE AFTER 11TH APRIL, KINDLY CHECK OUT THE UPDATED OFFER INSTEAD OF THIS OFFER. JIO DHAN DHANA DHAN OFFER DETAILS IS GIVEN HERE. On the evening of 31st March, when Jio Happy New Year Offer was ending, Reliance Jio played their masterstroke in converting all their users to Jio Prime, by announcing the Jio Summer Surprise Offer. And, in case you were wondering, this is NOT AN APRIL FOOL, confirmed. Little did other telecom operators imagine about this sudden strategic move by Jio. This will severely affect other telecom operators, including Vodafone and Airtel who were busy promoting their latest tariffs, competitive with Jio. Not only them, the telcos having relatively lower market shares like Aircel, Docomo, Telenor, etc., they will also be affected badly due to this. But it all comes to customer satisfaction ultimately. So, if you are a Jio user yourself, then you should not worry about all these and can cherish yourself as the Jio Summer Surprise Offer is made for you. On the evening of 31st March, at around 9 pm, with just 3 hours left to end the day, Jio called a press conference and declared their plans. Yes, friends, the first good news for you is that Jio Happy New Year Offer is extended for two weeks more. In their earlier announcement, Jio stated that their Happy New Year offer is going to end on 31st March 2017. But, according to their latest report, Jio Happy New Year Offer will remain until 15th of April 2017. So, existing Jio Users, you can continue enjoying the freebies you enjoyed till now for two weeks more. You don’t need to pay anything for that. You will still get 1GB Data per day, Unlimited Calls, and SMS. But you won’t be getting the Night time High-Speed Internet between 2 am to 5 am now. Considering its completely free, I don’t see anything bad in that. So, in brief, even without any further recharges, you will continue using your Happy New Year Offer till 15th April 2017. What Happens to Jio after 15th April 2017? After 15th April, accessing Jio network will be chargeable. You need to subscribe to any of the available Jio Plans to get the benefits. If you don’t do any recharges, your sim will become dormant, and you won’t be able to make calls or use internet data. You will, however, continue to receive calls and SMS on your VoLTE supported mobile. Those not having VoLTE supported mobile handset; they won’t receive calls either, due to lack of internet connection. They will only receive SMS. Luckily for you, Jio has announced their surprise benefit offer, known as Summer Surprise Offer, which will give you additional three months of Free Complimentary Services. 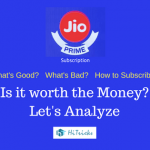 Jio Summer Surprise Offer is nothing but a bouquet of free complimentary extension of the services provided by Jio, for another three months, after you recharge with any Jio Tariff Plan worth Rs303 or above. Note that your recharge amount will not get wasted, it will be adjusted after these three months. So, in the 4th month, you are going to get the benefits of the recharge you did. High-Speed 4G Internet Data Every day for three months equivalent to the amount of recharge you do. Rs303 = 1GB per day, Rs499 = 2GB Per day, and so on. Once you high-speed internet quota is over, the speed of the internet will be reduced to 128kbps, but you can still use it. Unlimited Access to Complementary Jio Services such as JioTV, JioMags, JioNewspaper, JioCinema, JioMusic, etc. NO UNLIMITED HIGH-SPEED NIGHT DATA IS AVAILABLE BETWEEN 2 AM – 5 AM. It’s pretty impressive, isn’t it? The Jio Summer Surprise Offer will start from 16th April 2017 onwards and continue for three months, till 15th July 2017. During this period, you need not worry about paying anything. You will keep enjoying the services. 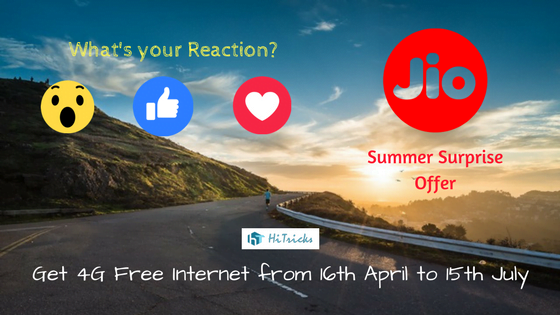 How to avail the Jio Summer Surprise Offer? You must be wondering how to subscribe to the Jio Summer Surprise Offer. Well, firstly, due to the exclusive nature of the offer, this offer is available only to Jio Prime Members. Jio Prime is an exclusive privilege membership offered by Reliance Jio to its subscribers. Under this membership, you will get lots of extra opportunities that the regular Jio users won’t be getting. The Jio Summer Surprise Offer is just one of the many surprises coming very soon to Jio Prime subscribers. Also, Jio Tariff Plans starting from Rs303 or above will give unlimited internet exclusively to Jio Prime Users. Check out the full tariff benefits of Jio Prime from Here. How to subscribe to Jio Prime? You can subscribe to Jio Prime by only doing a one-time recharge of Rs99 on your Reliance Jio number. The Jio Prime subscription validity will be one year, up to 15th April 2018. So, you need not worry about paying every month for the subscription. If you have not recharged to Jio Prime, do it asap. Visit your nearest Jio Retailer to do your recharge, or you can do it online from Jio.com website or MyJio App. You can also recharge from 3rd party recharge partners like PayTM, Freecharge or Mobikwik, etc. For detailed queries related to Jio Prime Recharges, you can check out this post, all your queries are answered. Okay, I have recharged Jio Prime. What next? Well, if you are a Jio Prime member, all you have to do is recharge with Rs303 or above to get yourself automatically enrolled to Jio Summer Surprise Offer. But don’t worry about your recharge, you will also get your recharge benefits. They will be applied post to the Summer Surprise Offer duration. So, suppose you have recharged with Rs303, it will get queued up on your number. So, from 1st April to 15th April: Jio Happy New Year Offer will continue. That’s just superb offer and unmatched with any other telecom operator in India as of now. As usual, you guys have different queries regarding Jio, and I am always ready to answer them. Here are the most commonly asked questions about the offer. I am sure you might be having similar queries, in that case, your doubt will be clarified. Check them below. Q: What happens after 15th April if I don’t do any recharges now? A: You won’t be able to make calls or SMS or use the internet. However, you will receive SMS. If you have a VoLTE supported device, you will receive calls. If you don’t have a VoLTE supported device, you won’t receive calls also, as calling requires active internet connection on non-VoLTE devices. After 90 days of not subscribing to any Jio Plan, your sim will be disconnected, and you cannot use it anymore. Q: I had recharged with the Rs149 plan. What happens now? Can I get the Complimentary Offer? A: The Jio Summer Surprise offer is only for those who subscribed to Jio Prime and then recharged with RS303 or above. If you have recharged with Rs149 then, unfortunately, you won’t be getting any such benefits. To get the benefits, you need to recharge with Rs99 for Jio Prime, or if you have already done it, you just need to recharge with Rs303 to get the same privileges. Don’t worry; your initial Rs149 won’t get wasted. They will be queued and will be adjusted after 16th July. So, from 16th July to 15th August, you will get the benefits of the Rs149 offer, and from 16th August to 15th September, you will get the advantages of the Rs303 offer which you recharged afterward. So, your money isn’t wasted, and it’s a win-win deal. Q: I have recharged with Rs303, but I wish to upgrade to Rs499 recharge so that I get 2GB Data per day. Is that possible? A: Quite surprisingly, yes it’s possible. You just need to recharge your Jio number to the denomination you want to, and it will be upgraded. During the summer surprise offer, you will be getting the benefits of the highest value recharge you did. So, if you did a Rs303 and a Rs499 recharge, you are going to get the benefits of Rs499 recharge over the summer surprise offer period. After the summer surprise offer period gets over, your recharges will be adjusted every month starting from 15th July in chronological order. So, if you did a Rs303 and Rs499 recharge, you will enjoy the benefits of Rs303 recharge for the 4th month, from 16th July to 15th August, followed by Rs499 recharge benefits from 16th August to 15th September. So, never worry about getting your money wasted with Jio. Its always safe! Q: What happens after 15th August? A: After 15th August, you need to recharge with any Jio Subscription plans to enjoy its benefits. And, as you will be a Jio Prime member, you will keep getting unlimited internet with those packs. If you have further queries, do comment, I will try my best to explain your doubts asap. So that’s all about the Jio Summer Surprise Offer. Thanks for reading the in-depth article. I hope all your doubts regarding the offer is clear now. In my opinion, this is the best offer an internet user can avail right now. Yes, I hear that Jio is not giving good network speeds in some areas. Well, let me confirm you that Jio will double the number of towers it has right now, and the speeds are bound to increase. Also, many people took multiple sim cards to get more internet data; they won’t be subscribing all their sim to this offer by paying Rs402 (99+303) each sim. So, the overall internet usage will be lesser on their network, making them more accessible to you. You can test the network speeds using Speedtest by Ookla. 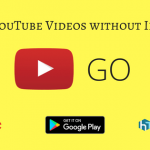 They also have an Android app on Google Play. Don’t forget to share this article with your friends and let them know about this incredible opportunity.